Compatible with sensorless brushless motor. Water-resistant and dust-proof. The ESC has been designed to work in wet conditions. Motor Type: Sensorless Brushless. Burst Current: 540A. Continuous Current: 80A. ► Continue current: 20A, (Burst max 25A 10 secs). ► Blue Motor Wire 14AWG. ► Low resistance PCB. ► Weight: 19g. Tri-mode operation auto detects the motor type for brushed, sensored or sensorless brushless motors. The VXL-3s uses advanced circuit design that allows sensorless brushless motors to operate with the smoothness and precision of the best brushed systems. Team Associated XP Digital Brushless Sensorless ESC. Brushless motors. Saxon House. Pre-wired for optional cooling fan. All products comply with UK laws and are primarily intended for use in the UK. Hard case with aluminum heat sink. Simply plug it in and flash! DYS USB Linker Programming Tool. This handy USB programming tool allows you to quickly and easily update the firmware of your ESC by connecting directly to the ESC's signal wire and then to the USB port of your PC. Mtroniks TIO-Marine 30 AMP ESC works with LiPo, Lead Acid, NiMh and NiCd Batteries. Wireless Madness was born out of love for RC Cars and RC Helicopters. Being long standing enthusiasts and experts in this field we bring together our know-how and experience into the hobby and toys world. Etronix Probe Waterproof Lipo Safe ESC. The perfect, affordable all round brushed ESC has arrived. The new Etronix Probe WP features a host of cool features that you might expect on a more expensive unit. The small size (20% smaller than the standard version XeRun XR10 Pro 1S). ESC Type: For Brushless Motors. This ESC features the data-logging function which will record the. Set Button on ESC: Not Supported. The Plush series ESC are a high quality ESC well known to experienced hobbyists. Cont Current: 30A. BEC : 5v / 2A. BEC Mode: Linear. Mystery 200a ubec esc DC 5.6v to 16.8v. New. I just bought this but did not check it did up to 12s. HOBBYWING MULTIFUNCTION LCD PROGRAM BOX. This multifunction program box is for programming HobbyWing brushless ESCs. Its friendly LCD interface makes ESC programming easy and quick. Besides, it’s compact, portable and very applicable for field use. All VIPER ESCs are capable of running the highest capacity cells available & the latest high spec motors. Each VIPER ESC incorporates a 1.2A BEC and the latest state of the art technology and GEN-Xi power FETs! HobbyWing QuicRun 10BL60 Features Hobbywing patented heat-conductive copper bar cover on the power board of the QUICRN 10BL60, which can efficiently and effectively transfer heat to the integrated CNC machined billet aluminum heat sink housing, combined with reticulate heatsink and high-performance cooling fan can keep your ESC as cool as possible. TURNIGY Plush 60a ESC with 3a/5v Bec. Cont Current: 60A. The Plush series ESC are a high quality ESC well known to experienced hobbyists. BEC : 5v / 3A. BEC Mode: Switching. Continuous: 60A (burst - 80A). New advanced programming software. Power arming protection (prevents the motor from accidentally running when switched on). Supports high RPM motors. Safety thermal over-load protection. Current: Continuous: 120A, Burst: 830A. Input: 3-4 cells NiMH/NiCd or 1S LiPo (Warning: 2S Lipo is not allowed). Motor Limit: >=3.0T ( For 3 slots, 2poles 540 size motor, and the ESC has zero timing). Turnigy 5A (8-40v) Switching BEC. Output (Constant): 5v/5A or 6v/5AInput: 8v-40v (2-10cell lipo). Type: Switching Input protection: Reverse polarity protection. Any missing item parts for reasons not due to our error. The MAX10 uses a Motor Thermal Protection circuit (in Sensorless Mode). You can upgrade the MAX10 with the Hobbywing WiFi/USB LINK software, a WiFi module/ LED or LCD program box and a smartphone/laptop. Racerstar PG50x4 50A 4in1 Blheli_32 2-6S 32bit ESC ProShot 5V BEC. 1x Racerstar PG50x4 50A 4in1 ESC. Supports Proshot, Oneshot42, Multishot, Dshot150/300/600/1200. Firmware : BLHeli_S 16.5 with Proshot, oneshot42 multishot, Dshot150/300/600/1200 support. The perfect, affordable all round brushed ESC has arrived. The new Etronix Probe WP features a host of cool features that you might expect on a more expensive unit. Etronix Probe WP ESC Features 15T Motor limit. HobbyWing is well known for their quality ESCs with many competition wins, great performance and stringent QC from Cars, boats, aero and now a purpose built Multirotor ESC. HobbyWing X-Rotor 40A 2-6S OPTO ESC For Multi-Rotors. The system is designed without sensor cable, allowing easier installation and maintenance High power connectors are fitted as standard throughout. Also order adaptor part ET0818 if you wish to use with conventional 7.2v Nimh batteries sporting the Tamiya connector. 1 x MSC-30BL-WP ESC unit (MV30003). Compatible with sensorless brushless motors. Motor Type: Sensorless Brushless. 1 x Maverick user set-up and programming instructions. Water-resistant and dust-proof. Battery Connector Type: Deans Connector. ESC Mode: Forward/Reverse. ESC Type: For Brushless Motors. Battery Compatibility: LiPo/NiMh. Supplied With LED Program Box. UK - Northern Scotland, Highlands, Islands £3.50. 20A Brushed ESC with Reverse & Optional Break For RC Cars Boats. 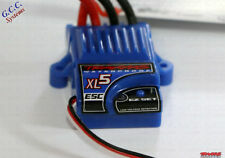 20A Brushed ESC with Reverse & Optional Brake For RC Cars Boats. Continuous: 20A. Brake: On / Off - switch on ESC. There is currenlty no user manul available for this ESC. The motor end connectors have had female connectors soldered on, the battery ends have been cut however it would be trivial to strip and attach new connectors to this end, these can be seen in the photo. The Racerstar Tattoo 30A BLHeli_32 is a 32bit ESC features the latest generation BLHeli_32 firmware, and it support the newest DSHOT 1200 protocol. The 32bit architecture enables the ESC to run at incredible speeds resulting in better performance, faster input signals and lower latency compared to older 8bit ESCs. Hobbywing EZRUN Max8 V3 150A ESC 4274 KV2200 Motor Combo TRAXXAS 1/8 4x4 Buggy. Hobbywing EZRUN MAX8 V3 150A ESC Program Card RC Car 1/8 Truck Buggy Traxxas. This multifunction program box is for programming HobbyWing brushless ESCs. They are compatible with PWM, DShot, Oneshot125, Oneshot42, and Multishot protocols. Supports DShot600/300/150, OneShot125, OneShot42, and MultiShot. Firmware : BLHeli_S v16.5 with DSHOT150/300/600, Oneshot 42, Multishot support. Castle Creations MM2 Mamba Monster 2 Waterproof 1/8 ESC. The Mamba Monster 2 includes a coupon for a free Castle Link USB device. This allows access to the full programming suite of adjustable settings that tune and tweak your vehicle to your preferences, resulting in an incredible RC driving experience. Output: Continuous 120A, Burst 760A. ESC Type: For Brushless Motors. Internal timing can be changed easily to make the ESC suitable for various of motors. ESC firmware can be updated through the USB adapter in the LCD Program Box. Hobbywing patented heat-conductive copper bar cover on the power board of the EZRUN 18A, which can efficiently and effectively transfer heat to the integrated CNC machined billet aluminum heat sink housing, combined with high-performance cooling fan can keep your ESC as cool as possible. Continuous current 18A. Burst current 22A. DC 5.6V - 16.8V.